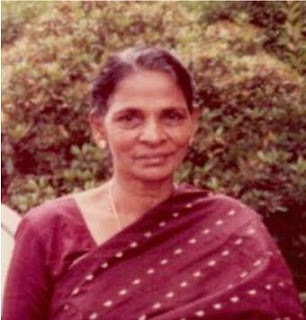 Mrs Hilda Kumar passed away peacefully on 26th May 2011 in England. She hails from Mathagal and is a beloved daughter of the late Mr and Mrs Seemanpillai. Loving wife of late V A Kumar (Kumar Master). Beloved mother of Emil (Mahen), late Jacintha (Rasathy), Basil Prema (Sri), and Maria (Mathy). Mother in law of Sybilla, Meena and Suresh. Loving grandmother of Jesse, Emil, Thavakumar, Rajeev, Thiru, Rasathy, Anjali and Joshua. Loving sister of Joseph Seemanpillai (deceased), Edward Seemanpillai (deceased), S Manuelpillai (deceased), Mrs Elsie Saverimuttu (deceased), and Grace Antony (Sri Lanka). Sister in law of Agnes, Rose, Catherine, Saverimuttu and Antony. Loving sister in law of Kandiah, Suppiah, Yogambihai, Kanakambikai, Kanahamma, Satkunam and Nagamma. Late Mrs Kumar was a renowned teacher for 40 years mainly at Holy Family Convent Ilavalai. Monday 30th May - Viewing at Longhurst Funeral Parlour from 3 to 6 pm. Address - A & E Longhurst, 21 Kingston Road, Ewell, Surrey, KT17 2DX. Tuesday 31st May - Vigil from 6 to 9 pm at Our Lady of Lourdes church, Hampton Court Way, Thames Ditton, Surrey, KT7 0LP. Wednesday 1st June - Funeral mass at Sacred Heart Church, Edge Hill, Wimbledon, London, SW19 4LU at 9.45 am; followed by burial at Kingston cemetery, Bonner Hill Road, Kingston upon Thames, KT1 3EZ at 12.30 pm. Fellowship lunch at Sacred Heart church hall at 1.30 pm. Contacts: Sybilla 079 5105 6107; Suresh 079 4100 1140.